I’ll be honest, I wasn’t really even aware of this brand before I was gifted four of their polishes. I mean, I had heard of Giorgio Armani, of course, but I didn’t know they even made nail polish! Here is some more honesty: these are amazing! The four polishes I was given are Spinel (Crimson Velvet), Oro Oscuro (Acid Velvet), Teatro and Zero. The bottles are stylish… but tiny. At 6 mL, these are some of the smallest “full-sized” bottles I have. To put that in perspective, it would take 3 of these to fill one Deborah Lippmann bottle, which is a similar price point. I feel that, considering my extensive polish collection, I will probably save these for special occasions – I won’t be pulling these out for random dotticures and such. These come in nice little boxes as well – I personally really like these kinds of boxes for polishes, but I know not everybody does. Of the four polishes I received, there are two mattes, one sheer and one cream. I will say this upfront, all of these had a simply divine formula and I absolutely love the Armani brush. These polishes all went on flawlessly with no pooling, streaking or problems in general. Perfection! Zero is a lovely white sheer. 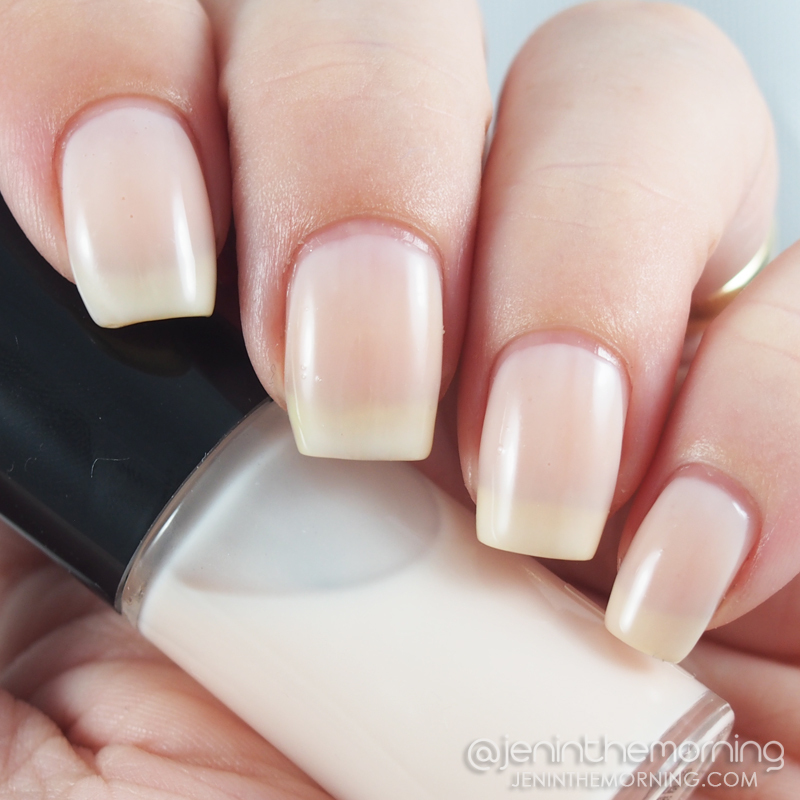 In the pictures above I am wearing 3 coats and Seche Vite, but one coat is perfect to give nails a groomed, uniform look. Sadly, my natural nails have a fair amount of staining from my beloved blue and green polishes, so this would be a lot more pretty on nails that don’t have staining. The formula was amazing! Unlike similar polishes like this I have tried, streaking was minimal and it levelled out really nicely, even at one coat. 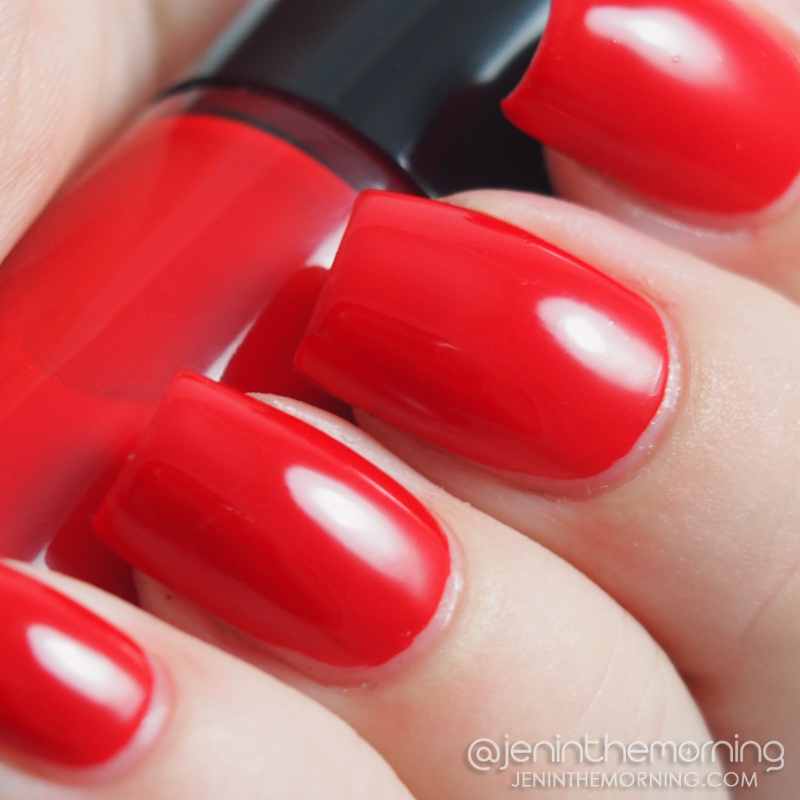 Teatro is a classic red creme. This one in particular leans a tad to the orange side, giving this a bright, vibrant feel. The formula on this one was incredible. It went on silky smooth and needed only 2 coats for full opacity. Shown above with two coats and Seche Vite. Wondering why this polish has a name in parenthesis? I discovered that the name on the website is listed as Spinel, but the box I received is labeled Crimson Velvet. I’m not sure which one is supposed to be correct, so I figured I better include both 🙂 In any case, Spinel is a shimmer-filled eggplant polish that dries to a true matte finish. This dries quite fast, so you cannot mess around much with application or you start to have pulling, but it goes on so smooth that you don’t have to fight at all to get the polish right where you want it. 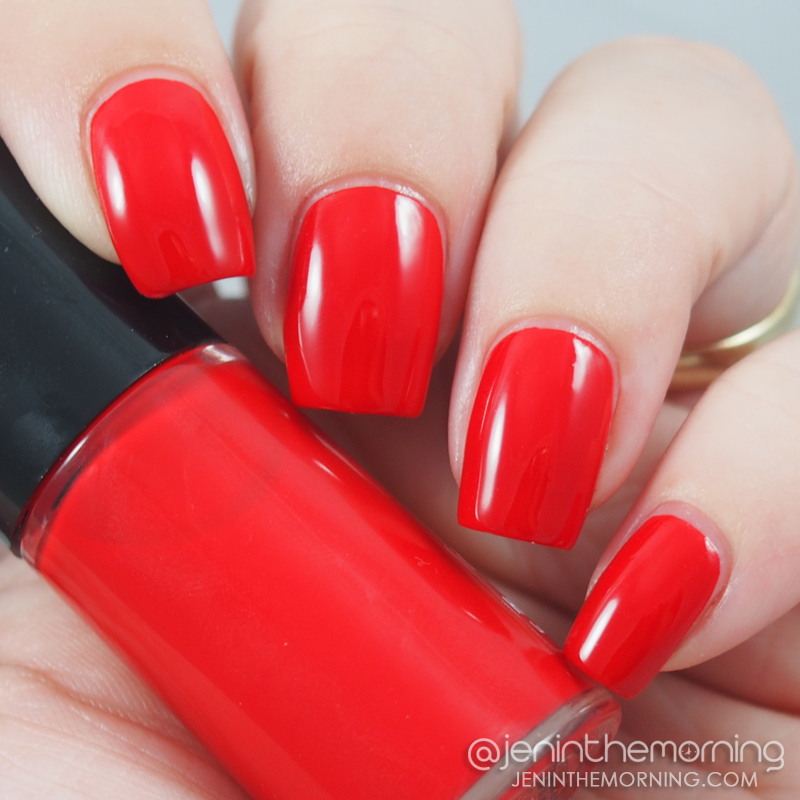 This has an amazingly opaque formula and you can allllmost get away with one coat. I used two here for full opacity. Here it is with a coat of Seche Vite on top. I tend to prefer a glossy finish, and I love how Spinel looks with Seche Vite on it. Oro Oscuro (Acid Velvet) is another one whose name on the website conflicts with the name on the box. 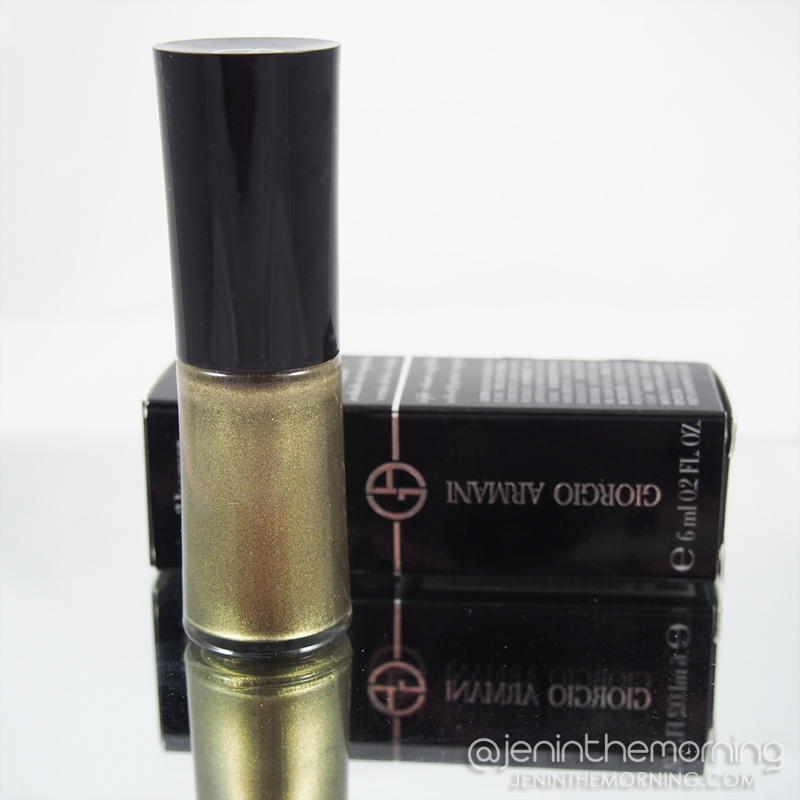 In any case, it is a gorgeous, gold-toned green shimmer that dries to a true matte finish. This picks up so many shades of green and gold, even when matted, that it is just stunning! The formula was very similar to Spinel. Almost a one coater, buttery smooth formula that goes on easily. Shown above is two coats. As with Spinel, I added a coat of Seche Vite and I love how shimmery this looks with a shiny topper. Overall, Spinel and Oro Oscuro were my favorites. I didn’t have anything like either of them in my collection previously. Both matte and shiny finishes are stunningly beautiful on the nail and the flawless formula makes them a dream to work with. All of these were amazing to work with. I find the price tag ($20) a bit hefty for the amount of polish you get, but you definitely get a quality product for that price. I wouldn’t hesitate to invest in more of their polishes at this point and have a couple more I will probably add to my ever-growing wish list. Those are all so gorgeous, that red looks amazing on you! Really lovely! They all look really nice and I love Teatro on you! 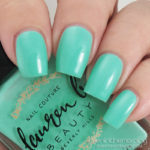 Great post and beautiful polishes! All of these are gorgeous, but those mattes? Love! These really look pretty! 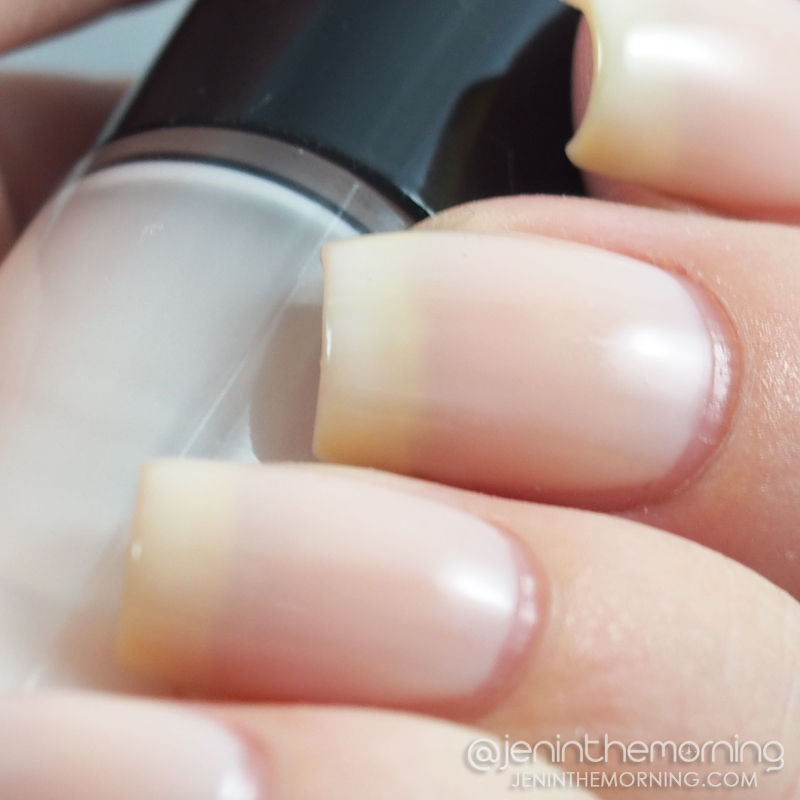 Sometimes high-end polishes are worth the money – I’m impressed at how non-streaky the sheer is. These are gorgeous! I don’t usually go for high end polish, wowza! Wow, I really love the look of these polishes even if I can not pronounce his name, haha! Lovely swatches, thank you for showing the difference top coat makes on Spinel and Oro Oscuro. Wow! These are stunning! And Teatro looks amazing on you. Wow, every single one of these is stunning.